What are common hydraulic problems, and what to look for? Regular, sensible maintenance procedures will always detect issues in hydraulic equipment, which can then be rectified before a permanent system failure occurs. Regarding hydraulic systems, there are some easily detectable symptoms that might give an early warning of potential root cause concerns. A professional plant maintenance company can help with diagnostics and repair. 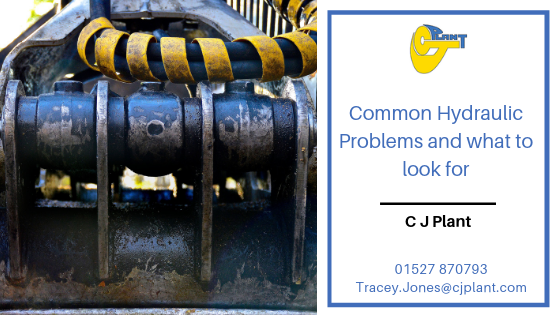 CJ Plant can offer a range of plant maintenance services, including heavy machinery repair, diagnosing hydraulic pump repairs and assessing hydraulic pump failure symptoms. Here we’ll outline some of the main common hydraulic problems and what to do if they arise. Aeration: The main cause of aeration is hydraulic fluid becoming contaminated with air. This can create a banging or knocking noise, when it circulates around the system, compressing and decompressing. This can sound quite worrying. Aeration can accelerate the degradation of hydraulic fluid. It can also cause damage to system components due to loss of lubrication, overheating and burning of seals. The hydraulic system allows air to enter through the pump’s inlet. It’s therefore sensible to make sure that any pump intake lines are in A1 condition and that any fittings around it are in good working order and tightened correctly. Over time, flexible intake lines can weaken and become porous. These should be replaced before too much degradation occurs. Fluid levels in reservoirs should be monitored. If it is too low, it should be filled to the correct level. In some types of system air can enter pumps through their shaft seal. If the condition of the pump seal is unsatisfactory, then this must be replaced. Cavitation: This occurs when the volume of fluid that is required by any part of a hydraulic circuit is more than the volume of fluid that is being supplied. This can cause the ‘absolute pressure’ in the circuit to fall to less than the vapour pressure of the hydraulic fluid. Vapour cavities can then form in the hydraulic fluid. These can implode when they get compressed which will cause a knocking noise. Cavitation in a hydraulic system is serious. It can cause metal erosion. This eventually damages hydraulic components, and also contaminates the fluid. In some extreme cases, it can cause system failure. It’s possible for cavitation to occur anywhere in a hydraulic circuit, but it’s most likely to happen at the pump. Inlet strainers that are clogged, or a restricted intake line can sometimes cause any fluid in there to vaporise. It is therefore important to make sure this part does not become clogged. Isolation lines in association with the intake line must be fully open. Intake lines between reservoirs and pumps should never be restricted. Intake lines of a flexible nature can sometimes collapse as they age. These should be replaced before they get to that point. 2. Is Fluid Temperature Too High? Degradation of fluid and seal damage can occur if fluid temperatures reach and exceed 82°C. Hydraulic systems shouldn’t be operated above this temperature. Fluid temperature is too high when it’s viscosity falls below the precise value to operate the system components safely. Heat is usually dissipated through the reservoir. It should always be monitored to make sure it is at the correct level. There should be no obstruction to air flow either from a build up of dirt or debris. Proper inspection of the heat exchanger will make sure that the core is not blocked. The flow rate of the hydraulic fluid and the cooling air/water is essential in allowing the heat exchanger to dissipate heat. Cooling circuit component parts should be examined and replaced as necessary. A relief valve that is improperly adjusted. High fluid temperature causes damage to system components through low viscosity of oil films. It makes sense to install fluid temperature alarms in systems and make sure that any high temperature indications are investigated and dealt with immediately. Often, the first indication that something isn’t right with a hydraulic system is when the machine experiences a reduction in performance. In a hydraulic system, flow is determined by both actuator speed and response. If there is a loss of speed, there is likely to be a loss of flow. External or internal leakage are the likely causes of flow escape from a hydraulic circuit. External leakage, for instance, a burst hose is often obvious and easy to locate. Internal leakage occurs in the pump, in the valves, or in the actuators. It is therefore less easy to spot and isolate. An infrared thermometer is often a useful tool for spotting any components with abnormal internal leakage. Sometimes, the use of a hydraulic flow-tester will be required too. Slow operation and high fluid temperature can more often than not appear together, and this often creates a vicious circle. Once an increase in fluid temperature occurs, this means that viscosity decreases. When this happens, that chances of internal leakages go up. If internal leakages increase, this automatically increases the heat load. In turn, this creates a further increase in fluid temperature. Unless this is spotted and dealt with, the cycle will continue. Continually and proactively monitoring noise levels, temperatures and cycle times are a simple but effective manner of making sure there are no costly component failures, system down time or plant shut downs. In many cases, all that is needed is careful, considered observation by trained professionals. If you have concerns about your hydraulic equipment or would like more information on how CJ Plant can help with all your plant needs, then simply visit our website and contact us today. We’d be happy to help and advise on any aspect of hydraulic pump repair.